Footballguys analyst John Lee talks strategy and DraftKings picks for the Week 3 NFL games. Advice for building your DraftKings Daily Fantasy Lineups. Green Bay Packers QB Aaron Rodgers (knee) did not participate in practice Thursday, Sept. 20. This should be the plan for Rodgers with his knee injury. He'll miss practice, have limited reps towards the end of the week and play. Rodgers is a QB1 for Fantasy GMs...even when he's not at 100 percent. Philadelphia Eagles QB Carson Wentz (knee) fully participated in practice Thursday, Sept. 20. Wentz is back in action for the Eagles this week. We're excited, but we don't want to get too carried away. We'll need to see him perform at the expected level before getting him into our fantasy lineups. He's a QB2 or streaming option in Week 3. Philadelphia Eagles WR Alshon Jeffery (shoulder) was limited during practice Thursday, Sept. 20. Carson Wentz returns this week for the Eagles, but we think Jeffery misses the game against the Colts on Sunday. That means Nelson Agholor, Zach Ertz and Dallas Goedert should get plenty of looks in Week 3. Ajayi is looking likely to miss this week. Practice squad call-up Josh Adams will get some work in his place, and Corey Clement becomes a much better play as the likely lead back. Buffalo Bills RB LeSean McCoy (ribs) maintained his limited status in practice Thursday, Sept. 20, while wearing a non-contact jersey. McCoy could play this weekend, but he shouldn't be near your lineup against the Vikings. Updating a previous report, Denver Broncos QB Case Keenum (knee) fully participated in practice Thursday, Sept. 20. He wanted to practice on Wednesday but the team gave him some rest as he was experiencing knee soreness. He hasn't been good this year but the Broncos are 2-0. We've got Keenum as a QB2 or streaming option on the road against the Ravens in Week 3. Oakland Raiders RB Marshawn Lynch (shoulder) was a limited participant in practice for the second straight day Thursday, Sept. 20. It's not a surprise for Lynch to have his practice reps monitored. We like him as a RB2 in Week 3 against the Dolphins. Arizona Cardinals WR Larry Fitzgerald (hamstring) was limited during practice Thursday, Sept. 20. Fitzgerald is likely to play on Sunday, but the Cardinals offense is not inspiring confidence. Fantasy GMs should look at Fitzgerald as a low-end WR2 or flex play in Week 3. Through two games in 2018, Richardson isn't exactly lighting up the box score. He's got eight catches for 85 yards and zero touchdowns so far this season. Fantasy GMs are looking elsewhere for starting help...even as a deep flex. Jacksonville Jaguars RB Leonard Fournette (hamstring) was limited during practice Thursday, Sept. 20. It looks like Fournette is on track to play Sunday against the Titans. We like projecting him as a RB2 this week after missing last week's game against the Patriots due to this hamstring injury. Jones needs to practice on Friday in order for us to trust him on Sunday. The game against the Saints presents a challenge as CB Marshon Lattimore should cover Jones. That being said, Jones projects as a WR1 anytime he hits the field so start him accordingly. Atlanta Falcons RB Devonta Freeman (knee) did not participate in practice Thursday, Sept. 20. We're not expecting Freeman this week against the Saints. That makes Tevin Coleman the lead back once again and projecting him as a low-end RB1 in Week 3 is fair. The Broncos have a tough run defense, surrendering an average of only 78.0 rushing yards per game (6th lowest). Collins has not seen the field that much due to the gamescript over the last two contests. If the Ravens can keep it close, then Collins should get more work. We like him as a low-end RB2 for Fantasy GMs in Week 3. New England Patriots RB Sony Michel (knee) fully participated in practice Thursday, Sept. 20. Michel touched the ball 11 times against the Jaguars in Week 2 (10 rushes, 1 reception) and room was hard to come by. Things should be different this week against a Lions defense that ranks 32nd in the league in rushing yards allowed per game (179.5). We like the rookie as a RB3 or flex play in Week 3. Gordon is set to get limited snaps for the Patriots on Sunday. We've got him as a 'what the heck' flex against the Lions in Week 3. Minnesota Vikings RB Dalvin Cook (hamstring) sat out of practice Thursday, Sept. 20. We'll know more about Cook's playing status on Friday. If he misses the game against the Bills (no need to rush him back against this opponent) then Latavius Murray would get the starting nod for the Vikings. There's no clarity on Mariota's playing status but it seems like he's trending towards getting back out there. It's a game against the Jaguars in Week 3 and that's bad news for his fantasy prospects. 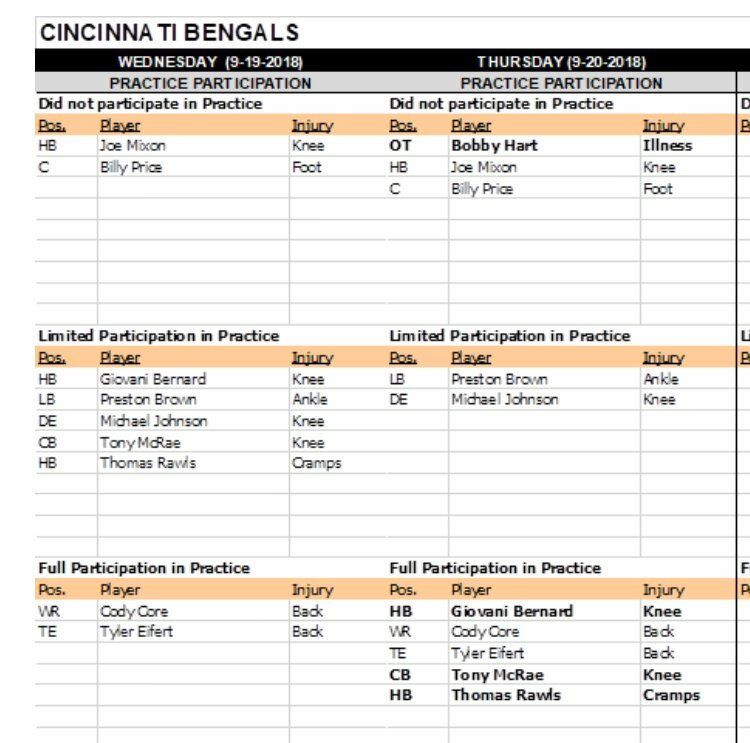 Bernard is going to be the lead back for the Bengals with Joe Mixon (knee) out. Against the Panthers on Sunday, we like Bernard as a low-end RB1 for Fantasy GMs. Buffalo Bills WR Kelvin Benjamin (hip) fully participated in practice Thursday, Sept. 20. We're not counting on players from the Bills passing game. Fantasy GMs have much better options...especially with the Bills playing against the Vikings this week. Indianapolis Colts WR T.Y. Hilton (quadriceps) was not practicing Thursday, Sept. 20, for a second straight day. The injury was thought to be minor but we need to see Hilton practice..even if he's limited...on Friday. Against the Eagles, Hilton should perform like a WR2 with upside for Fantasy GMs. Indianapolis Colts RB Marlon Mack (foot, hamstring) did not practice Thursday, Sept. 20. Mack is unlikely to play on Sunday against the Eagles. That means Jordan Wilkins and Nyheim Hines should see a larger opportunity...albeit in a tough matchup in Week 3. Mosley had an injury that seemed like it could have been a multi-week injury, but it appears that he'll be ready for the matchup with the Broncos this week. Kansas City Chiefs SS Eric Berry (heel) will be held out of practice Thursday, Sept. 20, and is not expected to play this week. Berry is one hope for the Chiefs defense to get a handle on their problems while the offense drags them to victories. He could return in time for the showdown with the Broncos next week. Houston Texans LB Jadeveon Clowney (back) said Thursday, Sept. 20, he play in the Week 3 game against the New York Giants after spending Week 2 on the inactive list. The Giants had a lot of trouble handling the Cowboys pass rush last week, so this is bad news for their offense. Miami Dolphins WR DeVante Parker (finger) is practicing Thursday, Sept. 20, and is looking more comfortable catching the ball. Parker isn't worth carrying in redraft leagues with the way the team is treating him like a non-essential part, but hang onto him in dynasty leagues. This sounds like a desperation move. The Cardinals offense only hope at this point is Josh Rosen and a new offensive coordinator.